2009 Vuelta winner Alejandro Valverde (Movistar) moved into the race lead after taking victory in the first uphill finish of this year’s race in Eibar. Valverde outsprinted Joaquim Rodriguez (Katusha), Great Britain’s Chris Froome (Team Sky) and Alberto Contador (Saxo Bank-Tinkoff Bank) at the end of a thrilling stage which saw the GC contender show their hands just three days into the race. The select four-man group broke away after Contador attacked 2.4km from the finish on the first-category Alto de Arrate. He was the stage’s main aggressor, frequently injecting pace into a lead group severely whittled down by the arduous nature of the climb. Froome never looked in danger and rode smartly to watch his rivals throughout, and beat Contador to take third on the line, and with it a key eight-second prime. Although Froome only had Richie Porte to count on on the Arrate, his Sky team-mates worked hard throughout and played a key role in bringing back the day’s breakaway, which included Philippe Gilbert (BMC Racing). British National Road Race champion Ian Stannard’s efforts on the approach to the final climb saw the race come back together again, before Froome led from the front. With the four-man group clear, Contador attempted to attack in the final kilometre, a slight downhill section in Eibar. 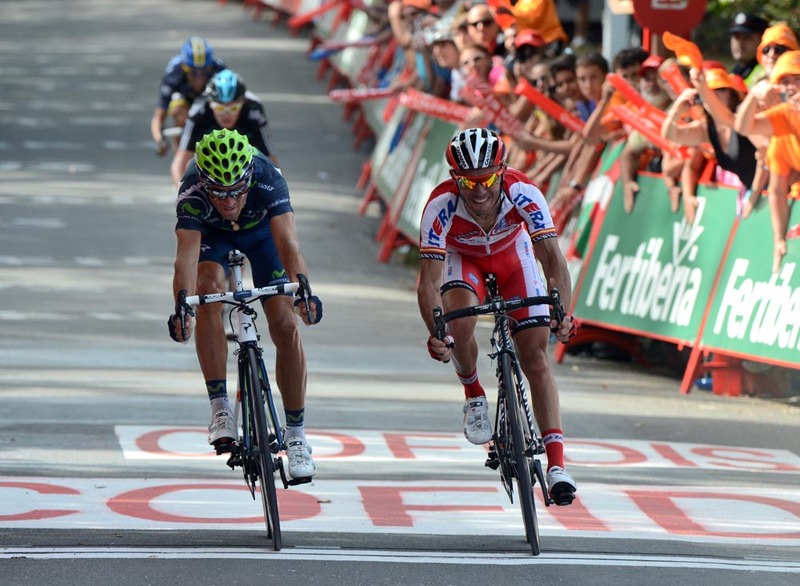 However Rodriguez and Valverde both accelerated past him and contested for the stage, which the latter won on the line. Froome’s positioning meant he too got the better of Contador to take third. Valverde’s team-mate and overnight race leader Jonathan Castroviejo was distanced on the climb, so the stage winner takes over the red jersey. Rodriguez moves up to third, 19 seconds off the lead, with Froome a further second behind him in fourth. 4. Alberto Contador (Esp) Saxo Bank-Tinkoff Bank all at st.
10. Robert Gesink (Ned) Rabobank all at st.